This frame only works for bolt on headboards and footboards. If you have a full size headboard and footboard that you wish was a queen size, that wish is a reality with this conversion rail system. This heavy duty bolt on steel rail system converts a Full size bed to accommodate a Queen size bedding set. The center leg is adjustable for varied heights and is a must for queen sized mattress sets. Ships in 3-5 business days plus transit. This rail system requires a sturdy headboard and footboard that bolt on at the headboard and footboard. 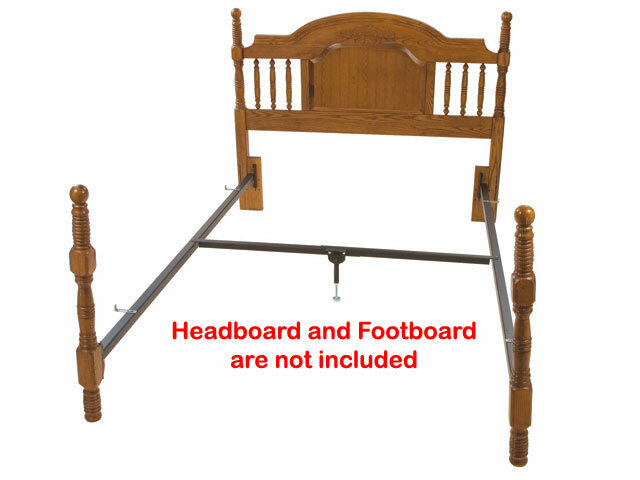 The headboard and footboard are not included. Full to Queen size conversion rail system. Comes with center support bar.